Patagonia® Denim uses only 100% organic cotton grown without GMO seeds, synthetic fertilizers, pesticides or herbicides. An innovative dyeing process enables us to reduce dramatically the use of water, energy and chemicals and produce less carbon dioxide compared to conventional denim dyeing processes. And our denim jeans are Fair Trade Certified™ for sewing. Denim fabric is made with cotton—a natural fiber. But conventionally grown cotton is one of the dirtiest crops on the planet. That’s why since 1996 we’ve used only organically grown cotton farmed without the usual mix of synthetic pesticides, herbicides, defoliants and fertilizers that can pollute water and air. Organic cotton agriculture uses non-GMO seeds and leverages nature-based solutions to manage pests and build healthy soil. All of the cotton in our denim jeans is organically grown. When it comes to giving denim its signature blue, most dye houses use synthetic indigo dye applied on huge production lines that use a lot of water and energy. Indigo doesn’t adhere readily to denim, which makes the dyeing, rinsing and garment-washing process resource intensive. We once used indigo to color Patagonia Denim, but now we employ Archroma Advanced Denim Technology, an innovative dye process that colors it with sulfur dyestuffs that bond more easily. This results in much shorter production lines that use 84% less water, 30% less energy and emit 25% less CO2 compared to conventional denim dyeing processes. And because we don’t sandblast, bleach or stonewash our denim to make it look worn, we avoid the serious social and environmental downsides of doing so. 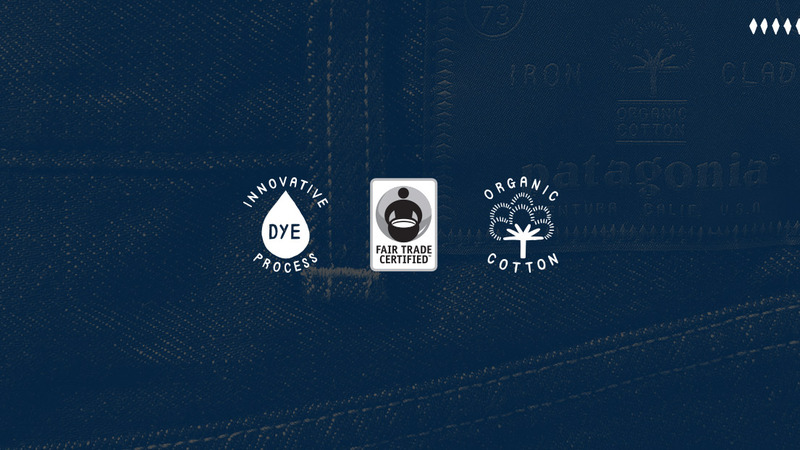 Our denim jeans are Fair Trade Certified® for sewing. Partnering with Fair Trade USA is one of the ways we’re helping garment workers get closer to a living wage. For each piece of Fair Trade Certified clothing, we pay a premium workers can use to improve their communities and elevate their standard of living. The workers decide how to use the money. They might choose to build a school or a health center, create a scholarship or take it as a bonus. Learn more about Archroma’s Advanced Denim technology.